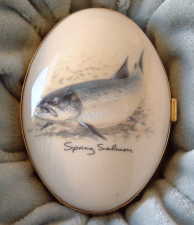 An attractive shaped ceramic salmon fish trinket box by 'Pointers of London'. Open the box to reveal a further picture of a fishing fly inside the lid. A lovely gift for the fisherman in your life. Fisherman's Fishing Flies on beige coloured braces. A 'Pointers of London' ceramic rainbow trout trinket box. A 'Pointers of London' ceramic grayling trinket box. An unusual fisherman tie tack with safety chain in 9ct gold. A beautiful present for those who love fishing. Gift boxed.